I read this morning that applying nail varnish without a base coat is like applying foundation without moisturiser. Perhaps that means something to the initiated. To me, it sounds like a joke missing a punchline. I’m still trying to work out the link between the two. Are they both quicker, dangerous, foolhardy, uncouth, or daring? This toastie recipe has the same air of mystery about it. The first impression it gives is of a simple recipe requiring just one frying pan. It’s just a toasted sandwich made with proscuitto and brie. However, I was completely thrown by the instruction “turn the oven on.” Why? Is making a toastie without turning the oven on like applying foundation without moisturiser? 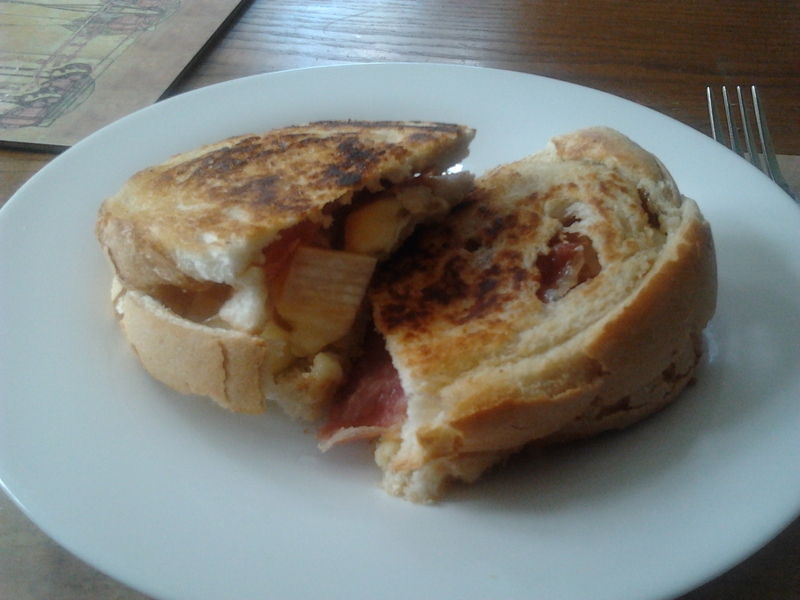 Anyway, it’s an awesome toastie, with a great combo of flavours and textures. In the photo, the brie is actually oozing out all over the plate, but I couldn’t get mine to do that. It did soften beautifully though! 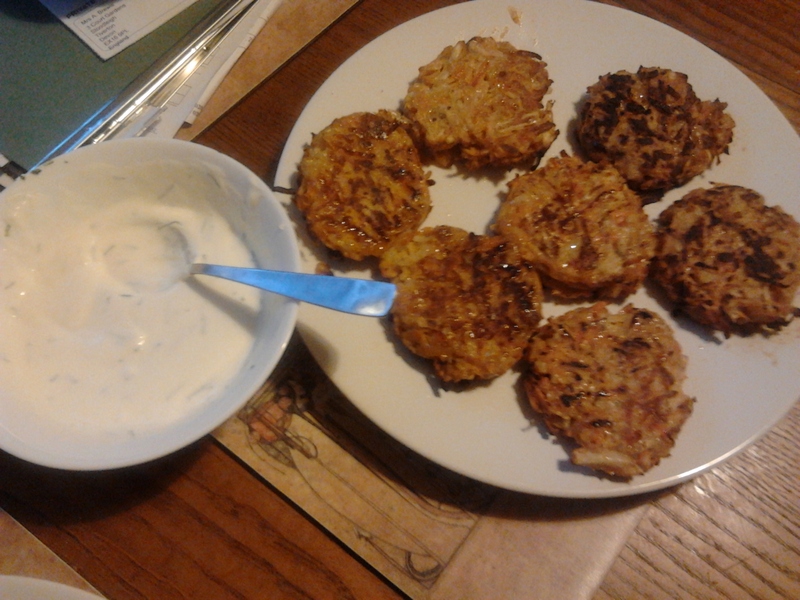 On the same day, I got my sister to help me make the rosti. 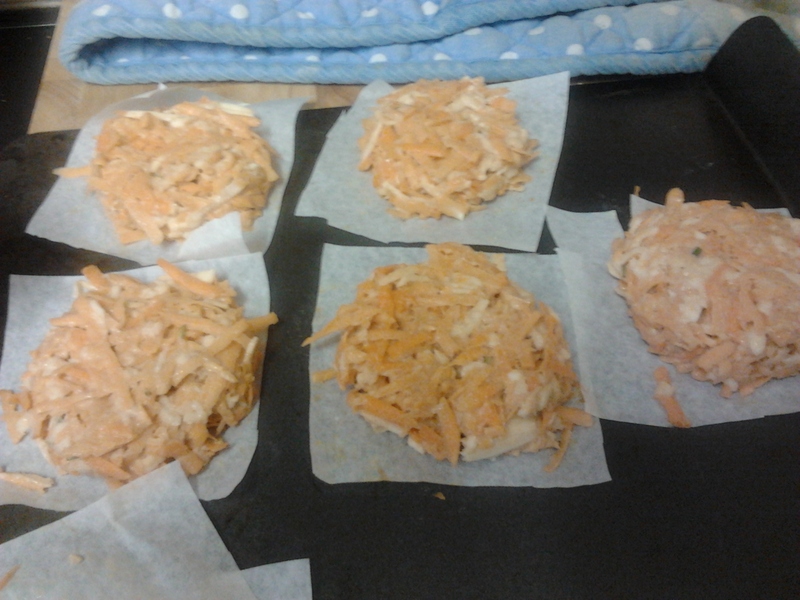 They’re made of grated parsnips, carrot and sweet potato, bound together with a bit of flour and egg (next time I’d grate using the food processor, unless I have an obliging sister present). We put them on little squares of greaseproof paper so you can tip them into the frying pan without them disintegrating. You fry them first for about 3 mins each side and then bake in the oven for 15 mins. Serve with creme fraiche with chives and a bit of lime juice stirred through. We ate them with a sausage and bean casserole, and they were yummy – sort of sweet and crunchy. Did she make you ‘eat your words’? Wrinkly says (and she likes a good wrinkle) you have to apply moisturiser first as the foundation won’t blend in and go on smoothly! You’ll roux not doing this!